PMSL! sorry but I found it funny about the colouring ;) I know what you mean with these Nellie images. What a fab card, I love your design, the lace on the corner looks brill! Your card is gorgeous Sassy. I love the sweet image and you have coloured her beautifully. The tradtional festive colours are wonderful. I often have some trouble colouring new images especially the more detailed ones. BROL, HRH too has no clue sometimes which part of the image belongs to wherever!! Tee hee, you're not alone! Oh my word, such a beautiful card. The image is perfectly coloured and what a wow embellishment. Sassy, this is so gorgeous. What a fabulous card Sassy - just adorable. I'm the same with some stamps - I just can't make out what goes where with some of them. Nice to know I'm not on my own! 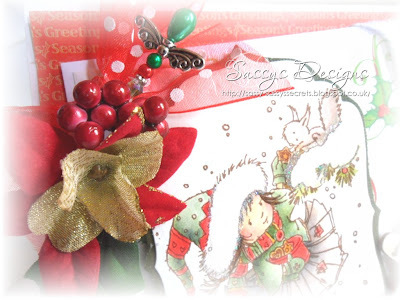 Hi Sassy awww how cute is this sweet image..yep me the same colour in wrong parts..thought it was only me did daft things like that..lol gorgeous design fab trad crimbo colours..thanks for the music had a lovely time singing with Dolly Parton..
Ohh wowww this is sooo adorable Sassy!!!! Beautiful embellishments and that image is so sweet! Anyway… I have to say your image looks awesome… you've coloured it so beautifully.. and I love the scrummy papers and embellies… the little gingerbread man… and the gorgeous flowers with the holly and berries… they are all just perfect.. it's a stunning card hun! Gorgeous card Mrs, I like the sweet image which is coloured beautifully I like the ginger bread man and the berries. Sassy, this is beautiful. I love the lace. I hope you have been doing well. I have missed visiting you the last week. I have been busy writing a paper for school. Beautiful as always sweetie. I have the same problem when colouring images. It's ok when you can look at how other people have coloured it, but there's been a few times when I have coloured up a brand new digi/stamp that hasn't been released yet for dt work and can't look to see how other people have coloured it. Just got to hope for the best! lol. I didn't even notice you had made a mistake. This is SO sweet! 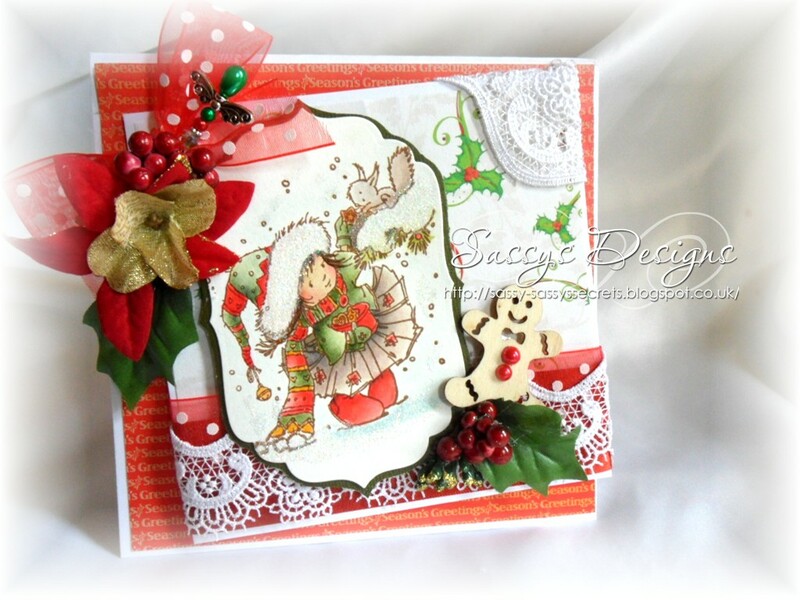 I especially like the adorable little gingerbread embellishment on your card! Oh wow Sassy this is stunning love all the elements and your colouring. A Beautiful card.